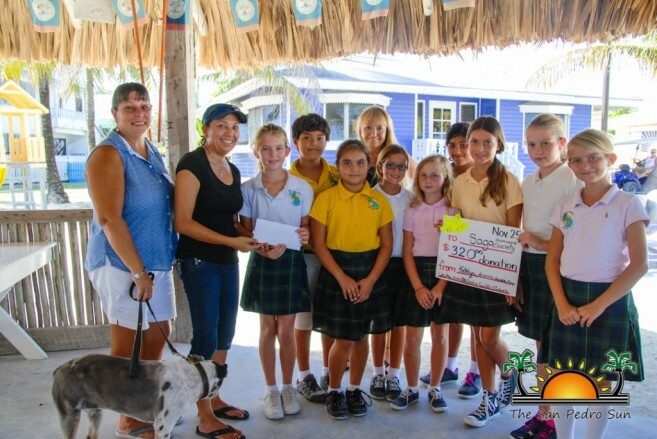 After participating in Saga Humane Society’s Humane Education Presentation, nine Island Academy students decided that they wanted to do a little more for the non-profit organization. Gabbi Alexander, Katelyn Mackay, Arianna Flota, Ayissa Alpuche, Maya Bowen, Louke Van Noord, Noah Beaumont, Alejandra Flota and Kimberly Houghton held a bake sale on Wednesday, November 19th at Wild Mango’s Restaurant to raise much-needed funds for Saga. Spearheading the bake sale was Gabbi, an animal lover who was inspired with Saga’s presentation. “I have a lot of pets and because of that, I wanted to do something for the pets that are over at Saga and don’t have a home of their own. Together with my friends, we decided to do a bake sale to help the animals,” said Gabbi. With the help of their parents, the Standard Two, Three and Four students prepared delicious pastries and treats that were quickly sold to hungry patrons. At the end of the sale the students had raised $320. On Tuesday, November 25th, the students presented the money to Saga Humane Society Director Katia Marin. “We are so grateful to all these students that took the time and effort to host this bake sale. Every single donation made to Saga helps to care for a pet in need. Only together as a community can we make San Pedro a pet friendly island,” said Marin.